I cringe to see the date of my last post pre-Hana. May! Well, it was just too busy a time at work and home to blog and I was getting to point where all I wanted to do was rest, rest and rest. But that was the last thing I was doing. I remember having classes to teach at night on top of my regular classes and preparing for a big event in August. I was always home late and hardly spent time with my kids coz they'd be sleeping or about to sleep. I was also away a lot. I had to do my induction, finally, no more postponing (that took up 12 hectic days of my life) and then I attended the AsiaTefl conference (3 days) and then it was my hubby's turn to be away. Being single mom wasn't easy but thank God for my parents and in my condition, they didn't allow me to stay home alone. Imagine, at my age, still staying with my parents! Only went back to my own house when hubby was around. Hubby also tried to clear as much of his workload so that he'd be around when the baby was born. Anyway, I began taking leave from work during the semester break so that my parents could go for a well-deserved holiday before my baby was born. After the break, I worked a few more days to make sure that everything was nice and tidy for the person taking over my responsibilities. Only by early-mid September, I finally was getting some rest. Since it was also time the baby was soon due, I really didn't fancy driving about 45 minutes to 1 hour to work and another 45 minutes to 1 hour back from work on my own. What if my water broke? What if I suffered from cramps? Haha maybe those were just excuses, but the fears were real. But basically, I just wanted to REST! Also it was fasting month and I was fasting despite being heavily pregnant, which wasn't that bad actually because as I have mentioned before, I didn't have much of an appetite. Because hubby was only back weekends, I prayed and prayed that the baby would be a weekend baby. Alas, the baby was not cooperating. On 17th night, my husband, after waiting and waiting for a sign, any sign that the baby was coming out, left for KL. The next morning, I had a show. I have never had a show before so my mom said she had a show once in the morning, and by evening, she had already given birth. I called my hubby, the poor man, to break the news but told him that he shouldn't hurry back coz mom said there was no hurry. She'd waited a good 12 hours before she felt any contractions. So I waited my good 12 hours and nothing. Hubby came home and come morning, we made our way to the clinic and was told that the passage was still closed. What! Baby's not coming out yet?! We went home. After two days, my hubby said, I have to go back but what happened, just when he was about to leave. Another show and again, no contractions. Now the poor soul was in two minds: Go back or stay back? The next day, I began having mild contractions, but few and far in between. Then they got closer and closer, every 5 minutes, then 3 minutes apart. I was scared but excited. Finally, my baby was coming out. NOT! It was another false alarm. So upon the advice of people around me, after iftar we made our to the hospital for the second time. Again, no passage. The nurse was disbelieving that I had contractions. Hello! I know what I was feeling. And sure enough the CTG proved that I was having contractions but alas, it just wasn't time yet. So home again we went. My hubby was like, "Hmm, nak kena rotan nie baby nie...so nakal", which means this baby seems to be asking for a caning. Hahaha Anyway, no way was I going back to the hospital with another false alarm and because Inez was late due to the cord round her neck, my mom was worried that it's history repeating itself. So we went to my monthly gynae for a scan. His is a 3D scan, so you can see if there's a cord round the baby's neck. Thank God, no cord round neck. Over the weekend, everyone came back for the hols, minus one, my hubby. So since I lived nearby I didn't put up at my parents. My kids though, didn't want to go home with me as Mimi and Naqib were there. Two mornings ago (Saturday), I told my mom that I'd be bringing over some nuggets for the kids. So to get them all into the shower, she enticed them with the nuggets I was bringing. Naqib overheard and started to say that he wanted nuggets which of course, weren't there yet. Naqib then asked Mika to give me a call. Mika said, "I cannot. I don't have my mommy's phone number but I got my own number. It's 882!" Hahahahahahahahaha! 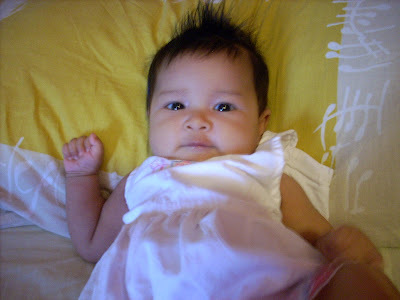 This is Baby Hana Danialle (pronounced Daniyal). I know, it's a boy's name with a girly twist to its spelling; so that's why I guess I sort of feel compelled to mention how it's pronounced as there have been many variations in the pronunciation of Hana's name especially by nurses in the hospital and clinics we've been to. Lemme see, we have had people calling her Hannah as in Hannah Montana. To be expected, of course. Some also pronounced Danialle like Danielle but the most unexpected was when I was paged by the payment counter for Ha-na Da-ni-yal-li! Haha serves us right! Mika and Inez are very happy with the baby, being near her and touching her and having her fingers grip on their finger and have even come up with an assortment of nicknames for her. It usually starts with, "Why don't we call her Cookie coz she's so sweet?" :) Or when she pukes, they'd want to call her Pukey and Pookey and since for the Malays, the latter is a taboo word (kinda like why the Americans don't pronounce 'can't' the way the British do), I say it's a no-no, don't ever call Hana that. And when she poops, they call her Poopy or Stinky or Stinkypoo. Then one day, Inez started calling Hana 'Lulu'. 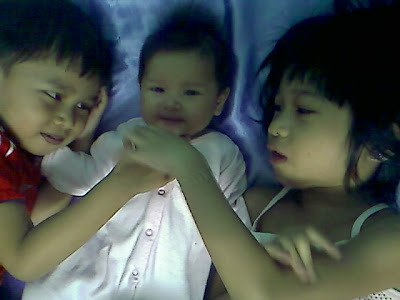 My hubby on the other hand loves to tease my older two, who'd say something like "Can we touch Baby Hana?" The answer would be, "No, but you can touch baby Danny." Then Mika would go, "No! Danny is a boy's name. Hana is a girl!" all exasperated with his daddy. Sometimes I have to get away from them so that Hana can sleep in peace, if not those two would be hovering over her...but all her awake moments, I try to include them in. Inez brings new clean diapers while Mika disposes of the soiled ones. It's great that they love their new baby sister and is not jealous of her. Mika wanted his Atuk to get a soft toy the other day, for baby Hana. I think that's just sweet. Did I say pencil marks? They are PEN MARKS! Last night I received a message from a friend who so happened to read my blog. Apparently she too had the same problem with pencil marks on the wall. However, her problem was solved with a little Axion and a rag. Happy, I got out my Axion and rag only to realise that the pencil marks weren't coming off because they weren't pencil marks but PEN MARKS! Oh how short-sighted could I be? I definitely have to get a new can of paint now and repaint that wall. Argh! No wonder the kids couldn't erase the lines at all. Q. How can I get ballpoint pen marks off a painted wall? REBECCA LEONG, Newton A. Rubbing alcohol is the cleaner most used for such marks. Others are acetone, Stain-X Carpet stain remover, sold in grocery stores; Ink-No-Mor, toothpaste, Vaseline and dry Brillo pads. With all these cleaners, try them on an obscure area to make sure they don't stain, rub off or affect the paint in any way. I went to other sites but alas, no luck. How do you get rid of pencil marks on the wall? Yesterday, my hubby made a startling discovery. We found 'senseless' (coz the letters made no sense) grafiti on the wall between the master bedroom and the children's room all written in pencil. It was Mika though he didn't say it. He kept quiet instead. I made the kids erase the writing as well, with erasers, but the lines won't come off. I tried water and soap but it was a futile effort. I used some heavy duty detergent by Sanden Brook but the paint sorta came off along with some of the pencil marks. I mean the pencil marks just got slightly lighter because paint was coming off as well, so that's too strong. I've given up but if anyone hs the solution, do share. I might have to repaint the wall. I would like to avoid doing that coz the paint alone cost RM30 and I'm just gonna use a little. Although the pencil marks didn't come off, still made the boy especially, rub the lines so that he won't do it again. He promised not to anymore but I'm not too sure if he'll keep his promise. On Tuesday last week, finally had time to go for a second opinion. I was actually the last visitor. Clinic closes at 6 p.m. I arrived at a quarter to. Had decided to wait at least a few days just in case there might be something wrong with the pregnancy. I mean if there's no change in the baby's size, then it's confirmed that the first doctor was right. Let me first say that I have never been to this doctor before, but he's recommended by the specialist I take my kids to. Apparently, all this while, there's an Obgyn specialist right next door and I never realised. I kid you not, that's how astute my powers of observation are. :) It just so happened that Inez had the beginnings of Urinary Tract Infection (UTI) the day before and had a bad rash and case of itchiness, more frequent trips to the toilet and as the night wore on, she even cried that peeing was painful. So, the next day, Tuesday, I went in a little late to take her to the doctor's who opens at 8:30 a.m. I did wonder if it could be some insect's bite but the doctor said that the redness would be on one side rather than on both. He stated two possibilities which were either a bacterial infection or a fungal infection. To recognise a fungal infection, there usually are tiny white spots and since he couldn't see any, he thinks it's the first. With some difficulty we finally managed to get Inez to pee in a plastic bottle for a urine test. The test results would come back in the evening and thankfully, it was negative. The white blood count in the urine is less than 10, so it hasn't gotten into her system yet. Thank God! Anyway, after the doctor has settled Inez, I voiced my worries about the hormone pills to him, and he suggested I go next door. But ordinarily, he said, doctors don't usually prescribe hormone pills as they can function as oral contraception. Since Inez was kinda late for F. Ain class, I decided to go next door in the evening. I got my mom to accompany me since my hubby had to work late. At first, I thought of not telling the doctor yet that this was actually my second trip to the doctor's. I wanted to see what he had to say. But Mom, being a mom, went directly to the heart of the matter and told all. The obgyn said that there's no indicator why I should be given hormone pills as I was not bleeding or spotting and I had not had a miscarriage before. And when he did a scan, guess what? The baby isn't undersized at all. And I found a magazine all about pregnancy that says that the size of 7 week old baby is about 1.8 cm. If only I found that magazine sooner. Then I would have known that the doctor didn't really know what he was talking about coz the first scan already showed 19mm. Anyway, it had a heart already too! It's just soooo amazing to see the tiny heart beating. I was so relieved that there was nothing wrong with my pregnancy and somewhat angry with the first doctor for making me go through all that worry for nothing! So the dates coincide now and I'm due early October. And the best part is the specialist charged cheaper by RM2! And I got free samples of Anmum and Enfamama too. Though I have to say, Anmum tastes better, especially the chocolate flavoured one. When I was pregnant with Inez and Mika, I used to put a spoonful of honey to help the milk go down better. According to my sis, who spoke to her lecturer. That doctor had no business prescribing hormone pills because I wasn't spotting or bleeding. She asked me to call the guy up and yell at him, "Are you trying to kill my baby?" Even if the baby is undersized, it's better to let that baby be as long as it's growing and healthy, which btw, we don't know yet until next week. I don't know. For other people's sake, I hope this is an isolated case. I really dunno if the doctor knows something I don't. Maybe he saw something in the scan, or maybe he's just plain incompetent. I don't know; all I know is that if he did, he should have said something and since I wasn't too impressed by him, I am going for a second opinion and see from there if I do have to continue with Turinal, that's the name of the pills, btw. I know I am going backwards, but it's okay, right? I actually found out that I was pregnant at the end of January. And it was actually the third test since I missed my period. All because I felt different. Some parts of me felt tender and swollen and sometimes there was this miraculous feeling that like there’s life growing in my womb. Just the day before, when I didn’t have time to eat breakfast, by the time I got to work, I was shivering. Although my skirt wasn’t tight, I felt like getting it off me. Two lines! Omigod, I am pregnant! In a way, I am happy about it. Broke news to Zul. Made sure he was fully awake when I broke the news to him. Didn’t want him to think that he dreamt it all. Zul smiled. He seemed pleased with the news. Oh, apparently, he thinks he’s figured out when the baby was conceived. LOL Crazy man! “Mm, so understanding,” I thought. But what if this is a boy Inez. Is it okay? And what if it’s a girl Mika, are you going to be okay? Will you be a good big brother and teach her how to play ball? Good, coz we don’t know yet whether it’ll be a boy or girl. “We’re gonna have to save money, coz it’s going to be expensive getting a new baby. That was so thoughtful of my kids. Then called my mom who went, "Well, if not now, you’d be too old by then. Now’s the best age." That’s true, not that I like to be reminded of age catching up. Then informed my youngest sis and WM. Told my officemates. Didn’t want to jinx this pregnancy, so am hoping for the best. I always wish that my kandungan will be great khalifah on earth. Finally went to see the doctor on Saturday. Although I would have preferred a lady doctor, I didn't feel like coming back in the afternoon just to do that. I had after all been procrastinating enough as it was. So I waited for my turn and after half an hour, my turn came. I have to say that I'm not too happy with this doctor. In all my experience being pregnant, I have only 1 horrible experience with 1st checkup and that was when I was pregnant with Inez. THis clinic was recommended and though the recommended doctor was not in, I agreed to see his colleague. When asked, I replied that I thought I was pregnant. She did a scan but couldn't find anything. So she asked me if I was certain. I said that I was. I did the home kit and it was positive. So she asked me to do another urine test and sure enough, the test result showed positive for pregnancy but the doctor said that the lines didn't seem to be too clear. She asked me if I wanted her to check if the baby was growing outside my womb! Nut case! Just because she wasn't efficient enough to see anything, and it would have been too early anyway, she made me worry unnecessarily that I might have complications! Needless to say, I never went back there and her esteemed colleague continued to deliver many of my friends' babies. My recent visit to the doctor has got me worried all over again. And I am not too sure if this is unnecessary worry or not. When I went to get my meds, I didn't realise I was getting more than folic acid. Turned out I also had to take some other pills just labelled hormones. Let's reenact the whole thing. Once we got the preliminary questions out of the way like why I was there, when my last period was, he concluded that I was about 8 weeks and he too jumped at the opportunity to do a scan. The nurse prepared me and the size of the baby now was about 19mm, and that, according to him, was the size of a 5 week old embryo (is that the right term?). So according to him, that's quite a huge difference. So I am supposed to come back in a week's time to do another scan to see if the size of the baby has increased or not and if it hasn't, it means that the baby's growth is stunted and he'd have to do D&C. Sounds painful already. So of course, my hubby was already asking why this would happen, coz I have been travelling and had just returned from Damai Laut the night before for a conference. I signed up for that before I knew I was pregnant and went on that long arduous journey by car! My hubby was like why can't you get a flight? I said it's too late to ask for one now unless you don't mind paying your own. I minded coz I sorta didn't want to go alone by myself. My friend btw, drove very carefully, and thoughtfully. Sidetracked again! Anyway, doctor said no nothing to do with travelling. If it happened, usually it's because of the genetic make-up and stuff, basically like a plant that grows halfway and stops. So, should we be worried? He said no, because 8 wks' just like a tentative date or something and we should go back and scan and see if the baby's size increased or not. Then he asked me about my morning sickness. Have I started vomitting? I said no. Have I bled? Nope. Strong or not my feelings of morning sickness? I said it's hard for me to say because even with my first two pregnancy, that didn't come so early. With Inez, I only started getting nausea and vomitting after four months. Then the vomitting came at all times of the day. It wasn't morning sickness, it was just sickness, full stop. I didn't have appetite and I fasted without any problems. With Mika, I've always said that Allah is so great that I was very strong when I was pregnant with Mika because I was travelling every week to KL and back for my studies. Although I had a poor appetite, I didn't vomit except for toothpaste induced vomiting early in the morning and at night. Before I could explain all that, he waived off my explanations and asked me, "this pregnancy, how is it?" I said, well, I feel woozy all the time and tired, and I am turned off certain food now and I have poor appetite but have to to eat all the time. If not, rasa angin, gitu." So he said, as long as that feeling is strong then the baby should be okay. I was telling my youngest sister and she went, "What's the logic in that? Does it mean that people with no morning sickness have weak babies? 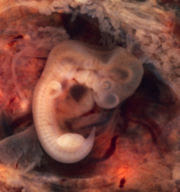 And there are cases where the morning sickness is so bad that the child is aborted." So with that, we left the clinic, and when it was time to eat medication, I discovered I had hormone pills as well. On the first day, I took the prescribed pills but on the second day, I began questioning their existence. I have never been given hormone pills before. Usually, it's always been folic acid and folic acid alone. Is there something that the doctor isn't telling me? Is this doctor a quack? Anyway, I tried to call the clinic back, but the doctor wasn't in. The nurse checked my records and the first question she asked me was if I was bleeding. I said no. Anyway, the hormone pills are supposedly to strengthen one's womb, but I consulted another doctor for a second opinion and she said that recent studies have shown that prescribing hormone pills does not prevent the inevitable from happening. The hormone pills he gave me was a generic one, whatever that means, but are supposedly harmless. According to my youngest sister, if I were given estrogen, estrogen would have caused uterine contraction and miscarriage. Normally, one doesn't prescribe hormone pills to pregnant ladies, coz they've got a lot of those already! So now I have a choice whether I want to eat the pills or not. I don't think so. If it's not meant to be, then, it isn't. All I can do now is pray for the best and that my baby is growing at normal pace, In`sya Allah! Anyone who's seen Fruits Basket knows that the poor cat is not a "true" member of the zodiac. The reason for this goes back to an old Chinese folk tale in which the animals were assigned to the cycle of years. A long long time ago, the Lord Buddha summoned all the animals together to determine their order in the yearly cycle. When the Cat heard the news, he let his friend the Rat know about it and the two animals decided to go together the next day. However, the next day the Rat did not wake the Cat who, being a cat and loving to nap, slept through the morning. Therefore, the Cat did not make it to the assembly on time and did not get a year. This is why there is no year of the Cat and this is also why cats hate rats. The Rat, on the other hand, made it there first and received the first year. He did not achieve this without trickery either. He knew that a small animal like him would not be able to compete with the others, so he begged the Ox to let him ride on its head. The Ox consented and they went together. Just when they were about to arrive, the Rat jumped off the Ox's head and got through the finish line first. This is why the year of the Rat is the first year in the cycle, and the year of the Ox is the second. The Boar, being lazy, came in last. Ha!ha!ha! The story above jogged my memory a little, and now I am quite certain that my memory is faulty! The reason why I am talking so much about the year of the pig is that drum roll, please! 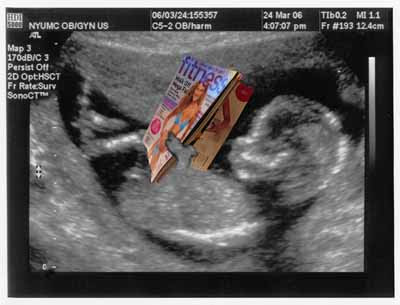 I am PREGNANT with my third child! Mom says that loads of people want to get babies in the year of the pig coz it's supposedly lucky. Have to do some research on how much luck we're talking about here. I hate to announce my pregnancy so early but now I understand why I have been soooooo tired and why my appetite has been soooooooo erratic and sooooo weird and why I can feel every aching muscle in my aching body. Lately, I have been getting all woozy and if I miss breakfast, my world starts to spin. BTW, that's why I have sleeping so much too! All this while, boley laa perasan awet muda but I tell you, once you get pregnant at this age, you dun feel awet muda anymore. I feel like a 75 year old. Maybe I should ween off my 3 inch heels but that means I have to go shoe-shopping first. Thre's no Modern Mom here, so that means, some time soon, I have to go to KL. Oh I swear I can't wait to slip into Modern Mom sandals. I hope they have improved the look of the sandals so I won't look so ah Poh like that. People born in the Year of the Boar are chivalrous, noble, and gallant. Whatever they do, they do with all their strength. For Boar Year people, there is no left or right and there is no retreat. They have tremendous fortitude and great honesty. They don't make many friends but they make them for life, and anyone having a Boar Year friend is fortunate, for they are extremely loyal. They don't talk much but have a great thirst for knowledge. They study a great deal and are generally well informed. Boar people are quick tempered, yet they hate arguments and quarreling. Also, they are kind to their loved ones. No matter how bad problems seem to be, Boar people try to work them out honestly, if sometimes, impulsively. They are most compatible with Rabbits and Sheep. Their opposite is the Snake. If were born in the Year of the Boar, your Fruits Basket character is: Kagura! Despite having all those nasty sayings like" fat like a pig, lazy like a pig", I must say I like what it says about Boar characters. And guess what? My dad is a boar too! Yesterday, I found out that I was misinformed by Mika. Apparently I had put too much faith in what Mikael said. I found out that the kids’ kindy doesn’t combine classes when they have computer lessons because although Mika has had his turn at the computer, Inez had yet to have hers. So on the way to school, Inez was saying how she hadn’t been for computer lessons and accused school of “cheating” her of her money. Wah wah wah! My mom was tickled that my daughter could accuse school of cheating her money. It turned out that school didn’t cheat her money after all as yesterday was Inez’s first computer class. She showed me her workbook and solemnly informed me that though there were many pretty stickers in the book, she could only peel them off upon their teacher’s instructions. Mom worked out that Inez’s computer lessons would be on Tuesdays, and Mika’s would be on Wednesdays. My mom also had some time to enquire about Mika. The Malay teacher volunteered information that Mika is usually the last to finish his classwork although he holds his pencil very well. Apparently, Mika is playful. Last month, I got Inez’s Art Class teacher to give Mika a tryout. When I came to collect my kids, the teacher was slowly shaking her head. She said Mika is bad at following directions and he daydreams a lot. Hmmm. Mom noticed how Mika said his goodbyes yesterday. He called out to Jungle Boy whose name is actually Daniel, “Bye bye Gang Gang!” (same pronunciation as Gung ho) and Daniel called back to him, “Bye bye Gang Gang!” Oh dear! I wonder if Daniel brings that word home and experiments with it with his own family. What must his family be thinking? What on earth does Gang Gang mean? Seriously, don’t look at me. I don’t have the answer either though I have been trying to get its meaning for ages. I know that it can sometimes mean ‘Eat’. But that’s all. In the background I could hear my mom asking Mika what he wanted from the shop. “Mika wants mee.”Lately Mika has taken a liking to those longevity noodles cooked in oyster and soy sauce with chicken meatballs. Inez too but biasalaa, Mika will eat more of it. Some days back, a friend asked me what chinese year would it be this year? I said I am not sure. She said it was very strange that there was no picture of any animal representing the coming year. So she's guessing it must be the year of the pig. So we asked my mom, who gave it a little thought, and confirmed that yea, most certainly this year is the year of the piggy! "A-hah! No wonder! I guessed correctly after all," said my friend. It's interesting, isn't it? That when it's the year of the pig, there is no sign nor sight of the pig. I know it's supposed to be haram for Muslims to consume or touch a pig but to have no pictures! To not know what is a pig! To not recognize a pig when you see one and touch one thinking that it's not one! That's depriving people too! One day a boy runs into the shop excitedly and exclaims to his dad, "Aboh! Aboh! Tengok, Aboh! Babi!" which translates "Dad! Dad! Look, Dad! Pig!" Dad slaps one hand on the back of his son's head saying, "Itu bukan babi!" which translate, "That's not a pig!" "Habis tu?" or "Then, what is it?" the boy asks. The father looked at the raccoon and said, "Itu musang!" All this while, a musang to me is a fox and a serigala is a wolf. Am I mistaken? I have been told by a friend that a raccoon is a jebon. Where do all these names come from? But it was reported some months back in the papers that a village in Perak, if I am not mistaken, thought they found a new species of animal which turned out to be a mongoose! HA!HA!HA! For those of you who don't know what a mongoose looks like, do watch Casino Royale `cause there's a mongoose fight scene somewhere at the beginning of the movie. I am going somewhere with this but I am afraid there's gonna be a Part 2. Soon, I promise, soon. This recent weekend, I was so woozy, I spent my time sleeping a lot, and my hubby let me sleep and did the vacuuming one time, two times, three times until he got so tired of vacuuming coz Mika kept dropping biscuit, then cake crumbs everywhere. When I was better, I vacuumed too coz hubby hated the vacuum on sight now and Mika was only allowed to eat under parental supervision. And because he did the vacuuming and cleaning, the children were allowed to mess up only their room. Should a toy end up anywhere outside their room, the toy would need tobe cleared up immediately; and Mika again, would be the usual culprit. Inez on the other hand would turn the channel the moment her father's back was turned despite already misused her TV time. She left her channel running and did God knows what but couldn't stand for the TV to be on other than Playhouse Disney. So by nightfall, her father was very strict. And I, though quite sympathetic, had to reinforce whatever my hubby's decision was. You know, united front and all that provided that it's deserving and justified. Then Inez came out with a drawing with a stick man and a stick woman with a huge X on each. She was quick to clarify that it meant NO ANGRY MOMMIES AND DADDIES ALLOWED! Cute huh? That cooled her daddy down a little and she was allowed to watch her show again after her daddy had watched his show until finish. Yesterday, Inez made me proud. She finished her homework all by herself. No help at all from me or her daddy. I also didn't have to sit with her until she finished. Maybe she learnt it from Mika. I dunno but I hope this i not a one day wonder.